CAMP HANSEN, Okinawa, Japan — Okinawa is the home of some of the most stunning sites in the world. Tropical reefs, sandy beaches and green mountains drape the island from one cape to the other; however, amidst the spectacle of nature's glory, there rests a few dangers that all should be aware of. A few times every month when construction work takes place on Okinawa, the opened Earth reveals unexploded ordnance left over from the battle of Okinawa in 1945, according to Master Sgt. Michael T. Dailey at 3rd Force Service Support Group. "Okinawa was the last major conflict of the Pacific Theater Island-Hopping Campaign during World War II," Dailey said. "Because of this we are still being called regularly to respond to unexploded ordnance from that era which is just now being uncovered or exposed. Every time construction requirements call for earth to be broken on or off base there is a good chance unexploded ordnance may be found." Unexploded ordnance, or UXO, may not seem hazardous due to its old age, but the longer the ammunition goes unnoticed, the more perilous it can get. If an individual finds UXO on Okinawa or in the surrounding water, they should leave it alone and contact local authorities to have it properly removed, explains Dailey. "We would prefer they mark the item in the water or on land and report it immediately to the local police department out in town or if on base to the Provost Marshal's Office. Local police officers can be contacted by calling 110, and on base 911. These emergency responders have procedures in place to handle such emergencies. We discourage those that find an item and may think it is a dud, or unfired and safe to handle. These items are not worth the consequences should the item be live." Once the call to the proper authorities is made, a team of technicians from EOD platoon on Camp Hansen is called to solve the problem. 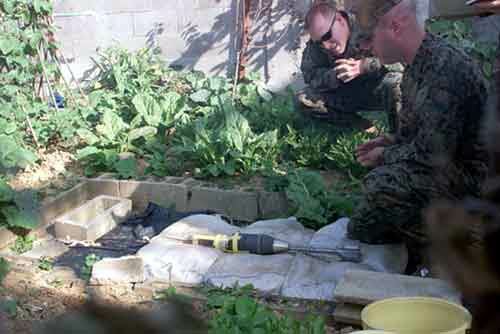 Recently the Marines from EOD platoon responded to a call near Gushikawa City where UXO was reported in the garden of a local Okinawan home. The UXO had been moved from where it was previously found nearly 40 years ago and used as a centerpiece in the garden of the home. The quick works of the EOD technicians took care of the problem by eliminating the UXO in a controlled, underground explosion. Instances such as this occur regularly for the technicians, according to Dailey. "We are currently averaging 15 or more calls a month," Dailey said. "Some are what we would classify as a category D incident, which constitute no threat. We also handle categories C and B, which are somewhat more of a threat. These are for such cases as dud grenades, stuck rounds, and other UXO found by either military or civilian personnel. Category C and B make up about a third of our calls. We have yet to be tasked with a Category A incident which constitutes a grave and immediate threat." Although UXO has claimed several lives over the years, Marines from EOD have saved countless others by responding to all calls of found explosives. Throughout their numerous duties as EOD technicians, the Marines from EOD platoon also rely on the local police departments and Japanese Ground Self Defense Force units, a relationship which Dailey explains is very important. "Our working relationship is important with the Japanese," Dailey concluded. "As host nation they are naturally concerned with their country and we share that concern. We also share a common interest in reducing all explosive hazards that exist locally and internationally."